An increasing number of services to the citizens of the Russian Federation is available in electronic form. In connection with the improvement of service and for minors it was necessary to obtain a personal account number in OPS (mandatory pension insurance). Making SNILS – insurance number of individual personal account – will allow the child to participate in various areas of insurance. The insurance certificate of Obligatory Pension Insurance (OPS) is a small green plastic card. This document is proof that the Russian citizen is registered in the system of Pension insurance. Until recently, such a certificate could be obtained only by those persons who have already reached adulthood, or during employment. The main content of the plastic green card is the insurance number of individual personal account PF. Abbreviated this number called social security number, and in accordance with the current legislation it can be obtained and the child – regardless of age. It is expected that in the near future, one card will be combined an extensive set of documents – travel, financial, insurance, identity. Refer to obtaining SNILS management of the Pension Fund – it can be done at the place of residence and place of residence. They provide a complete list of documents. If you have the opportunity to immediately provide all the documents on the list, there will be only a couple of weeks to wait and the baby will be registered in the system OPS. In the hands of the parent who made the statement is issued child has a personal account number. 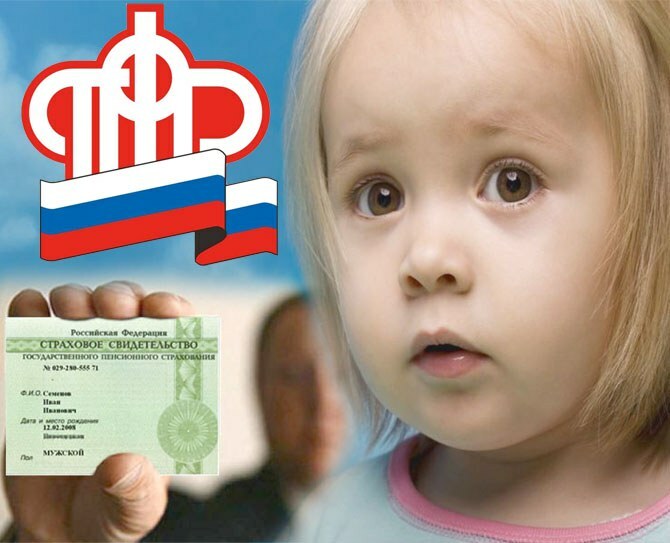 Provision of social and health services of the population provides the possibility of registration SNILS for a child who is a citizen of Russia is not, but live in its territory, temporarily or permanently. This is done due to the fact that the role of OPS has been increasing, and therefore the legislation was made necessary changes. It is mandatory the presence of adolescents since the age of fourteen, because at this age are supposed to have a passport. When making SNILS for a teenager older than fourteen basic document passport. The teenager himself is the applicant in the statement must be present in PF. In some regions of the Russian Federation plastic insurance certificate can give children attending College – College, College, school, even in kindergarten. In these cases, either the parents or the child to appeal to the PF not required. With the achievement of higher service electronically even getting basic medical services will be without SNILS quite problematic. The presence of a child under 14 years in the territorial office of the Pension Fund is not compulsory. The main institution, where possible in any case get the child social security number – office of the Pension Fund at the place of residence of the child or his place of registration. With the development of modern technology, perhaps even making SNILS via the Internet.